Update – This area is now called Half Dome Village, but everything else has remained pretty much the same. Yosemite is one of my favorite places to go in all of California, maybe even in the whole United States. It is exceptionally beautiful, and even though it is full of people, it still allows you to feel a closeness with nature by just walking a couple of miles up some of the popular paths. The hardest thing about traveling to Yosemite is finding a cheap place to stay though, as it is not strange for places to sell out 6 months to a year in advance. 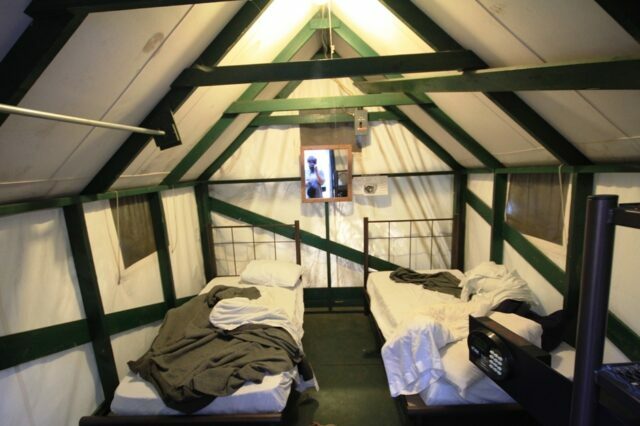 There are a few campgrounds and a few lodges but if you are looking for a good in between you should consider the tent cabins in Curry Village. Founded in 1899 by two Indiana school teachers, it originally had a dozen spots and was created as a cheap way to visit this national treasure. In 1922 a dance and pool hall was added then a half decade later a pool and ice skating rink. Since then it has continued to be a popular place for families looking to explore Yosemite and be part of a fun community in the park. 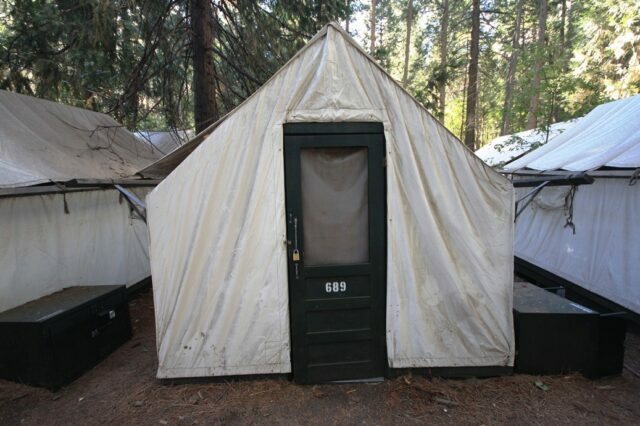 While not fully camping, most Curry Village spots are made up of a canvas tent, a safe for valuables and two single beds. Kind of like roughing it, well actually it’s not like roughing it at all. The campsite itself has a lot of pros and a lot of cons, but if I can tell you one thing it would be to bring earplugs, as the canvas does not keep out the noise. Curry Village takes reservations well in advance. If you know when you want to go, make sure you look online and book it as soon as you can, the longer you wait the less likely there will be a spot available. You can book spots here and here is the tentative schedule as it closes when it starts snowing and gets to cold. Mandatory quiet hours from 10PM to 6AM, and yes they will come by and tell you if you are being to loud, which is anything over a whisper. Right in the heart of Yosemite Valley, a half mile from the start of the Mist Trail and right next to two shuttle stops which will help you get around the park. There is also a buffet, coffee-house, pizza place, grocery store and a wi-fi lobby near the tents. 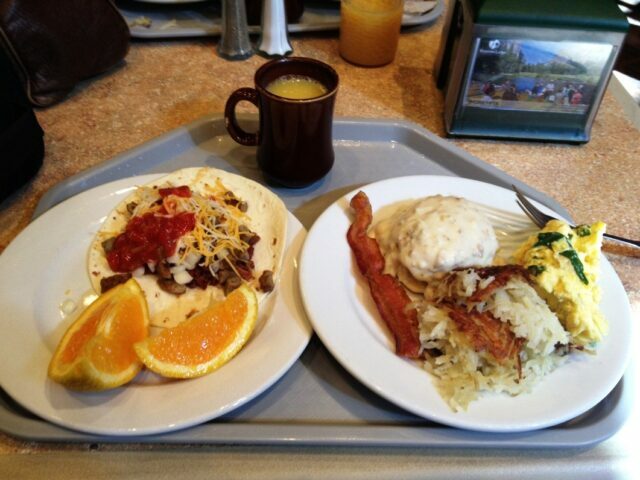 The pizza place is great, the buffet is average but it is nice to get a full breakfast for 10 to 15 bucks at the buffet before heading out to hike. This is a great place to stay if making a Half Dome ascent. 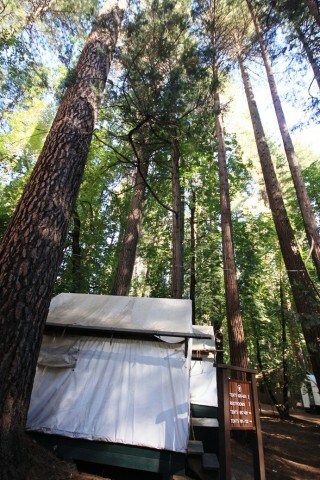 The campground area is large, but there are so many tents there that the accommodation are really close together. This wouldn’t be a problem but you only have a small piece of canvas and 4 to 5 feet between you and the next family, and depending on whether they snore or are noisy this could turn into a rough night of sleeping. We got ear plugs from the store right there in the village though and had no problem blocking out the noise, so make sure you come prepared. 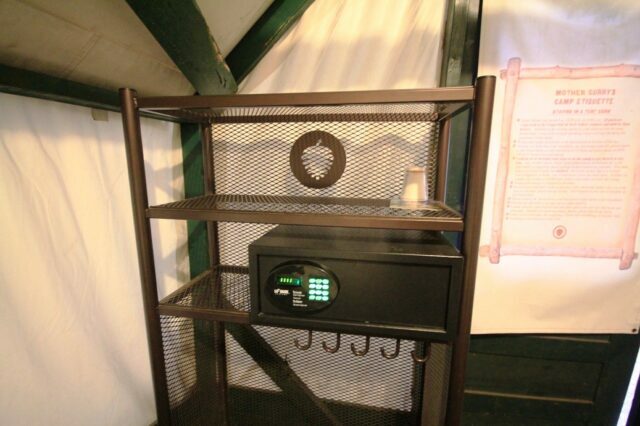 The tents themselves have a lock on the front so you can leave valuables and not feel like they are unprotected. They also have a safe inside for anything you would not like out in the open. I thought this was a nice touch as it allowed me to leave my camera somewhere safe while exploring the area. The location itself is amazing. Being right next to the shuttle allows you to park and not need your car for as long as you want to stay. That plus the closeness to the Mist Trail, the one that leads to Half Dome and one of the best trails in the park, and Mirror Lake makes it an easy recommendation. 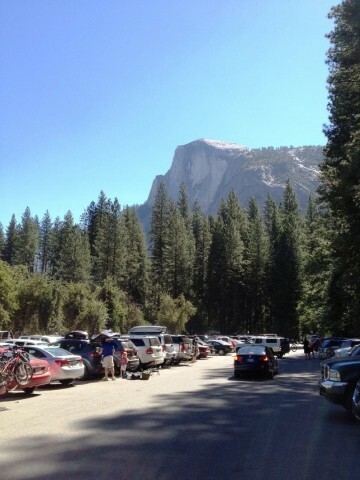 If you are in Yosemite though, is there really a bad place to be in the park? Also, make sure you take all food out of your cars as it is not unusual for bears to break in looking for a snack. 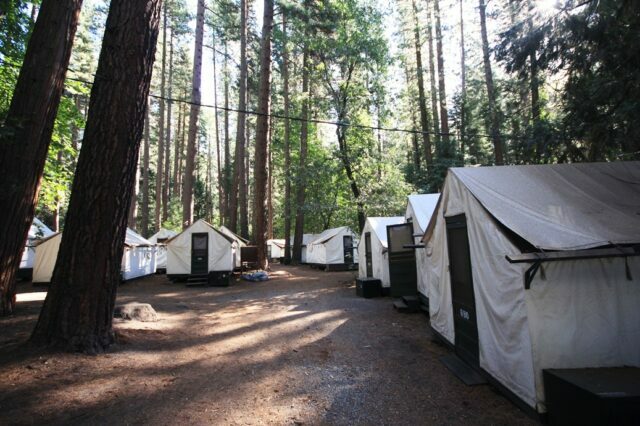 The tents themselves are surrounding by granite walls and forest trees, and the parking lot provides a great vantage point of Half Dome towering above. There are multiple bathrooms with running water around the camp, and there are two areas where you can take a shower if you are staying in Curry Village. 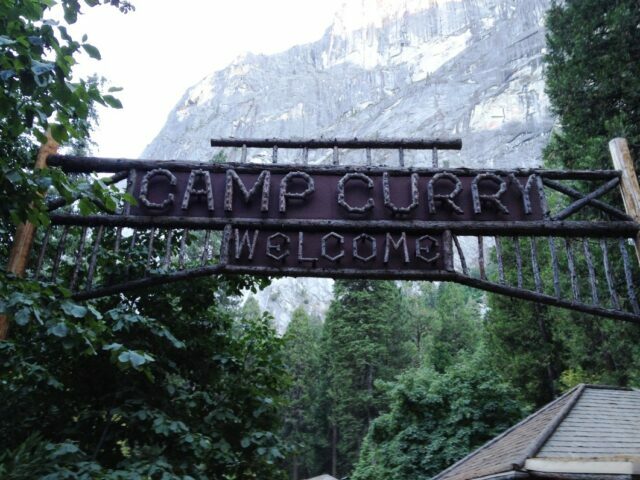 For a cheaper place to stay in Yosemite, Curry Village is an easy recommendation. It is a great place for the whole family as it puts you right in the heart of Yosemite but still keeps you close to modern amenities. For the Half Dome hiker it is a great base camp as well. You can complete the summit and walk right into the buffet (yes, I have done this). Make sure to leave a comment below if you have recommendations.